By: Brian G. Burton, Ed.D. Contact sales@BurtonsMediaGroup.com for more information or volume purchases. Free updates for the life of the eBook! Schools and bookstores should contact sales@BurtonsMediaGroup.com for volume pricing or review copy requests. 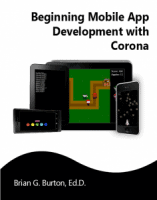 Corona SDK allows the mobile app and game developer to create for multiple platforms at the same time. With the ability to develop for Apple iOS, Android, Windows Desktop, and Mac, you can turn your idea into the next best selling app! Create apps in less time for multiple markets and mobile devices without tedious rewriting. Includes multiple app examples and how to make top-down and tower defense games! Beginning Mobile App Development with Corona is designed to be used as a textbook in college or advanced High School course. Version 1.011 – Minor formatting improvements in ePub & mobi versions and typo fix. Replaced .strokeWidth for lines with .stroke in chapter 5. Version 1.01- Updated name change from Ansca Mobile to Corona Labs. Removed references in chapter 14 to Papaya and Virtual Credits that have been depreciated in current version of Corona SDK. Minor corrections (no program changes) to fix typos. Version 1.5 – MAJOR UPDATE: Updates to: Pedagogy/andragogy & clarity improved throughout the textbook; Update to Widgets chapter to Widgets 2.0; Updates for API changes; Update to new Sprite API. New Content: How to add Custom Fonts; New Chapter on System Events, GPS, Accelerometer, Compass, and other system tools; New example on working with JSON Files. Version 1.8 – Many small updates through-out the book. Version 1.8.02 – Minor updates to structure and updating of external links. Chapter 1: Hello World: Setup and Get Going! Let’s Get this Game Going!